I found a problem while charging my iPhone 5 today. After I plugged in the lightning cable to charge I accidentally bumped it and noticed it had stopped charging. So I slightly wiggled the connector left and right. While doing this I noticed that it would start charging (it made the charge sound) then it would stop charging. It would also reflect on the battery icon as well. I’m not too happy about this and think this should be something Apple should fix. Update: this problem seems to be with the Lightning to USB cable which is sold by Apple. The cable included in the iPhone 5 packaging does not have this same issue. Have you found this with your device too? Leave a comment. I would like to hear from you on this. I am having a similar problem -with the cord that came with the phone, as well as an extra one I bought. This just started 2 days ago. I updated my post about the cable that came with my iPhone working just fine I’m sorry to hear that’s not the same for you. I also purchased 2 extra cables form the Apple store and both of the two cables seem to be experience this problem. I plan on returning mine in hopes that these were defects. Thanks for your comment and please keep us updated on your issue. The problem IS NOT the cable. I just took my iP5 back to Best Buy for an exchange because it was having the same problem of not making a connection for charging after only 3 months of moderate use. The problem intensifies until you can no longer make any connection. And why should I have to jiggle the plug to make a good connection?!!! The tech at BB said he’s seen this way too much and he’s amazed Apple hasn’t done anything about this defective design/phone hardware problem. Now I will end up with a refurb since I got mine in May 2013 & Geek Squad no longer swaps out a defective phone with a new one. Unless Apple addresses this, I’m holding off buying another Apple device with the Lightning connector. I’m having the exact same problem. I purchased additional cable and it won’t work with wall outlet or computer either. The one that came with the phone is “hit or miss” as to connecting and synching with the computer. Not good!! From what I experienced if you move the connector side to side or up and down you may get it to make a connection and charge. If not you should definitely take it to an Apple store either way. They will most likely swap out the device for you. Sorry to hear your having trouble. My iPhone 5 has got through two cables and it looks like I will need a third. All night it makes the connect sound then after a short time it makes the disconnect sound. I have muted the sound and sometimes my phone will vibrate constantly!! I am using the apple wall plug and an apple lead. I have cleaned ports not sure what else to do. I guess it’s a trip to my local store. The cables are crap. I’ve already replaced three of them. Ive also had the USB plug in box go out. If you have a previous model cord, you can buy an adapter piece to use on the 5. They seem to be made better. But I’m sick of having to drive over 50 miles to the nearest apple store to replace it so I’m getting a different brand. I’m having the same issues with my cord. I went as far as taking it back to the verizon store, but once there it started working with no problem! The next day same issue. I tried an I phone 4s usb charger cord with my wall adapter and it worked fine. I think there is a problem with the phone picking up the charge. Pulling the connector up if it will damage the dock on my phone. Glad you got it to charge! Have you considered taking it to Apple for an exchange? This sounds like a defect that would be difficult to live with, but that is your call my friend.Good Luck. I been thinking about it but it took them 4 weeks to ship my phone so if I go for an exchange who knows how much longer I got to wait, I might do it when there’s more phones available, thank you for you time! You have a point Lou, but Apple should have some stock in house so you quite possibly can get a replacement on the spot. Worth a shot! When I first got my 5 in November, the charger that came with it did not work at all; I went to the Apple store and they gave me a new charger. Now I am experiencing problems again. I have to wiggle the charger around to get it to charge, and if I move it even slightly once it starts, it makes the humming sound and stops charging. Very frustrating. The closest Apple store to me is 45 miles away, so it’s also costing me money. That’s very unfortunate, sorry to hear you are still having issues. Apple should replace the device if you are willing to make another trip back to the store. I would suggest taking the charger and cable that you use to show them the issue. 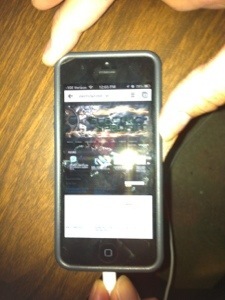 My iPhone 5 began not recognizing the lightning plug after I uploaded the new iOS 6.1. It won’t charge with any of my three Apple Lightning to USB plugs when using the standard Apple charging cube. If I plug the same cords into my laptop and re-boot the iPhone, it recognizes the plug and begins charging. Wiggling the cord has no effect. John, have you tried to restore it? When you do make sure to restore as a new device and see if that corrects your problem. Well I have 2 lighting cables for the iPhone 5 both shipped by Apple. 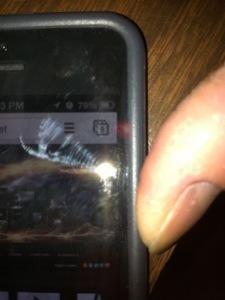 SO this has to be hardware in the bottom of the phone, not making good contact. Very frustrating to say the least ! Mine does the exact same thing. If I move my phone even slightly the charging flickers ff and on and the charging noise drives me nuts. It’s definitely gotta be something with the phone. Official Lightning connectors contain an authentication chip that makes it difficult for third-party manufacturers to produce compatible accessories without being approved by Apple. Nevertheless, Chinese company iPhone5mod began selling an iPhone 5 dock charging station in October 2012 and claimed that it could “bypass Apple’s authentication functions” using “cracked chips”. iOS 7 enforces a block on any Lightning plug that is not authorized by Apple. You are exactly correct. I have experienced that also with a third party mophie-like external battery case. But I my case I was using the original Apple lightning cable as I believe most of the other commenters are using as well. Sometimes it will work when simply just flipped over and plugged back in. So I believe the issue is with quality assurance. There inconsistencies with these cables and or the lightning port one the devices themselves. This seems to be a growing concern. Thanks for your comment and thanks for visiting the site. Hope you continue to stop by. I use the cord that came with the phone and have the same problem. Even with my iPhone 5 car charger that I bought with the phone. That’s not not a good sign. Have you tried to take it to Apple? Or If you have access to more cables, say a friends cable that works on their phone and still have the same issue. Take it to an Ape store and they will replace the device. I haven’t taken it to an apple store yet but I will. My best friend has the exact same phone and I used hers and had the same problem. I believe it’s the phone and not the cords. That’s what I was thinking but suggested using another cord just to make sure. Sorry to here you’re have this issue. I’m sure Apple will replace it out. Good luck and let us know what the outcome is after your visit to Apple. My wife and I both have iPhone 5s and our kids have the new iPods. Between the cables that came with the units and about 4 spare cables, the 2 iPhones are both experiencing the same problem with any of the cables. The phones were purchased at the same time and started experiencing the problem about the same time. The iPods still charge ok (for now). I agree, it appears to be a phone contact issue that declines with age. And from the above posts its not an isolated issue. I will certainly be contacting Apple to see if they can refurbish or replace the phones. For now, firmly inserting the cable and carefully setting it down seems to get the job done. I am on my 3rd authentic Apple iphone 5 charging cable and all 3 of them say “charging not supported with this device”. It seems like the cord is not very stable at the plug and wears out very quickly. I hate that they changed the charging devices for the 5. The cables for the 3 & 4 had no issues at all. Apple should recall & improve. Hate to be just another “Me, too” poster, but that’s the case. I’ve been having the issue more and more frequently and haven’t come across the magic twist or jiggle process, yet. Luck is more my process. Has Apple (broken with tradition and) acknowledged the issue? Aside from all of the response received here I have not seen it on any other forums. Not to say its not there but as you can see from the feedback there has been a large response to this issue. It’s a shame to see an issue like this. I expect a higher quality from Apple. After going through 3 charger cords in 5 months, someone gave me a great idea. I took the little spring from an old pen and put it on my charger wire down by the connector. The problem is that the wires inside become worn after repeated bending; the spring keeps them from bending at that critical point. I’ve had the spring on there since April, no issues at all. Interesting fix…I’d like to see a pic of how you did this. Not sure it’s something I would recommend a permanent fix though. As with other commenters I would suggest a trip to the Apple store to have them look at it. If under warranty they will exchange free of charge. I had a tech look at my phone. He told me that the socket was full of pocket lint. After cleaning, it worked like new. It was packed in, so had to be picked out. Compressed air alone didn’t do it. My wife’s phone has had the same problem, but I have yet to try cleaning it myself. That will be the final test. Glad you were able to fix the problem. I have seen that in the 30pin connectors but this is the first for the iphone5. I was also having a charging problem. With pressure I could get the phone to charge but it kept getting worse. I looked to see if lint was in the port but I saw none. I used a toothpick and passed through one time and got lint. Repeated process until I got no more lint out. Connected to cable and no longer have charging problem. Note I carry phone in front pocket all the time and apparently the lint has built up over time. Thanks for the suggestion as I thought the problem was the phone contacts and not a lint problem. Yeah man mine did this too and now I am having problems again any ideas? It seems to be a defect with either the charger or the the port on the phone. I would suggest taking both into an Apple location and show them the issue. As long as its still under warranty they will replace free of charge. I agree! This should not be an issue with this device. If you want to find the problem your self you could try different cables to see which one works but my advice would be to make an appointment with a Apple location and let them fix it for you. Hopefully it’s still under warranty and you can get it swapped out at no charge. My guess is that the issue is in the chip, that goes in the port, or the port! Do you think the issue is with the battery? I’ve also noticed it slower when texting and doing other stuff while charging, but it only happens sometimes…does anyone have the same issue? I wouldn’t rule out the battery, good point. Is there any reason you don’t want to take it to Apple? Is it no longer under warranty? Understood. Please let us know what you find and good luck. Issue. That’s weird that you have gone through so many cables. Not sure what conditions they are being used in. I still have and am using the original cable my phone came with. I am pretty careful with the cable but the the two that I purchased from Apple I still use as well and have this issue from time to time. I agree with what you said about Apple designing a MagSafe style cable for I phone. I think that would be a much needed improvement. And make a cord that works! I had this problem and I took the cord out, flipped it over, plugged it back in, and it works just fine. I love the wealth of information on the internet! I was having a charging problem as well. Someone on this blog mentioned lint in the connection port. I broke out a flashlight and some glasses to look into the charging port, and found a small part of a pine needle in there. It was just enough to stop the pins from connecting properly, even though it felt like a very snug fit/connection. I pulled out the pine needle with a dental pick and everything is working fine. Sorry to hear that! As Apple has become such large staple in the tech industry. Nothing can go without imperfections. Even for Apple and I do think that this is a design flaw that Apple has yet to recognize. 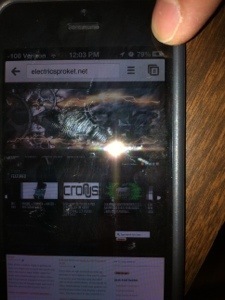 Some of our commenters have had luck in cleaning the lightning port. As lint tends to collect there but in your case much like mine. It has happened with a new device. I would suggest trying a different cable or even making a trip to the Apple store to remedy. I wish I had a DIY fix but since it’s a new device your best option would be the Apple store. Good luck and I hope they can replace your device. I’ve been wiggling mine for a couple months now. Just this week it decided to not charge no matter what. Spoke to Apple support and was told I should have bought the extended warranty. Thanks, Apple. I love my iphone but wont buy another if it comes with a lightning plug. I might feel better if Apple would at least aknowlege the problem but we know that won’t happen. I have brought my 9th lightning cable today, I’ve had my iPhone5 7 months and I am having a nightmare with the cable and charging problems.. Not happy at all! buying replacement parts soon after use begins. My daughter and I have the same problem. The charger that came w the phone was the first to go. Then I got another apple lightning USB charger and I died too! I ordered 3 off of Amazon for like 5.00 and they are ALL dead! My daughter and I are now sharing the charger I bought at Target made by Belkin and so far it’s been the BEST by far! I will go back to target and get another ASAP! Try the Belkin lightning USB. The others fail! I’m sure it voids apple warranty tho since it’s Belkin and not apple so I would not mention that part to your carrier if u do call bc they will note that in ur account! My Mom has also already had to replace her charger! And she has the new iPhone 5s!! Hope this helps you! thanks Angie, I will try the Belkin one. I’ve gone through 2 Apple cords (will never buy another apple phone till they fix the cord issue) and another one I got from Best Buy (rocketfish maybe) – mine was like some of the others on here – working, then I’d flip it over – worked ok for a while – moving it around, etc…eventually went dead. these cords are horrible and I blame Apple for the design (which I haven’t come to expect from them) – I also think Apple purposely made the cord small so people would have issues with them – one little problem probably makes them tens of millions of dollars. After reading the comments above, I was very discouraged since my iPhone 5 has been getting worse and worse in terms of its ease of charging. If I held the cord in a certain position it would charge, but once I let go it would stop charging. I was preparing to head for the Apple store but decided to whip out a toothpick first. It was like seeing clowns emerge from a car. Four times I thought I had all of the lint out and each time I was able to find more lint. After many pokes and a fair amount of blowing, it seemed to be clean. I inserted the power cord and it seems now to be working perfectly. Not even a month old and I have to go purchase a new one not like I already did to pay enough for the dang phone! Same thing as above bumped it and it stopped working…. Thank you to the person who mentioned the pocket lint! My husbands phone wouldn’t charge. I used a toothpick and a paper clip and picked out all the lint from where you plug in the charger and it now works!! That exact same thing is happening on mine. Did you figure it out? It won’t work plugged in to the wall or my iHome. It did the same thing where it kept going on and off from charging quickly. If you’ve had your phone for a while check inside the lightning port with a flashlight, if needed. Make sure there is no lint or dirt packed in there. If so, power off the phone and use a toothpick or a small paper clip and carefully dislodge the obstruction. Power it back on when finished and try it again and it should work. Had the same problem and we’re a family with 3 phones so thought it was related to lightning cable from transformer. Nope, it was lint in the phone port. Had some GUM go-between proxabush teeth cleaners and used them to clear out lint from the port and now all wires working where before only two out of 10 worked for my phone. I’ve had the same problem . Same with my iPad mini. Ironically when I have a 3 charger docking station I bought of eBay charges everything just fine , but when in use the power cord & plug it in the. I have issues . It’s. Very frustrating . I love having my phone but when I leave my place and take a charger with me it’s difficult to charge . I used a plastic coated paper clip and cleaned a ton of lint out. I used an air can before and that did nothing. I would highly recommend this. Some cords do go bad if they are bent a lot at the male end and it is usually visable when there has been to much stress. It starts to bulg at the end. I’m having the same issue. On further inspection the connector is corroded. Thought it was potential humidity issues in my room so I used my work charger. Noticed the issue starting again. Once again corrosion is happening on that charger. Time to upgrade to a samsung.